I accept that I am somewhat old-fashioned at times but I truly do not understand why youth these days have such a DEATH FASCINATION. What makes them flock to movies about zombies and underworldly creatures? Why do they long to be scared and then try so hard to make themselves look like they’re half-dead by using makeup and mutilating their bodies and slashing their clothing? Sure, I like a good vampire movie sometimes, but it doesn’t make me leave the movie theater wanting to seek a victim and sink my canine teeth into them to have a drink! A young cousin died last week, leaving behind her 7-month-old son motherless for her husband to raise. She was playing with her precious child, her only child, and had a sudden heart attack. A couple of hours later her brother came to her house and found her there, and the screaming baby. This baby boy of hers was her ‘miracle baby‘….the child that the family had prayed for a very long time. She’d had many miscarriages until two years ago she gave birth to a little boy that died on the same day that he was born. So when this baby was born healthy, the family rejoiced! My cousin stayed home with her baby boy and I am so very glad that she posted almost-daily photos of him and often of the the two or three of them on Facebook. As it turns out, she packed a lotta loving into 7 short months and the little boy will have plenty of photos. I was physically unable to travel to Indiana for the funeral. During the middle of the wake, I got a text from a cousin telling me that the body of our cousin looked terrible and that the makeup job was very bad. In her opinion (she’s a medical professional), the body should not been shown in an open casket because it’d been too long since her death. She also mentioned that this particular funeral home hasn’t done good makeup for the past several years. This concerns me because both of our mothers (sisters) have their funerals planned and prepaid at this same place and I doubt if there’s anything that I will be able to do about it when the time comes. I knew that Mama would’ve also gone to this particular wake so I talked to her that evening. She was nearly in tears as she told me how badly our cousin looked laying there in her coffin, and that even though the room was full of about 100 relatives, nobody was lined up to view the body. That’s so sad. Last night I was chatting on Facebook with another cousin, who told me that she stayed for quite awhile but had to leave when kids started taking ‘selfies‘ of themselves with the body. That is MAXIMUM DISRESPECT. My cousin even told me that she was glad that I wasn’t there to see that! I tell you what….if I were, I would’ve grabbed thosed kids and gotten their cellphones and erased those pictures! I don’t understand why their parents would allow that. Or why the funeral home director would allow that. I just told my youngest son about it and he agreed that it’s horrible but that evidently it’s a ‘FAD‘ now to post a photo of oneself on the Internet with a coffin. To me, this is beyond belief! The photo I’ve posted above is a ‘prop photo op‘ from Universal Studios‘ Halloween Horror Nights. 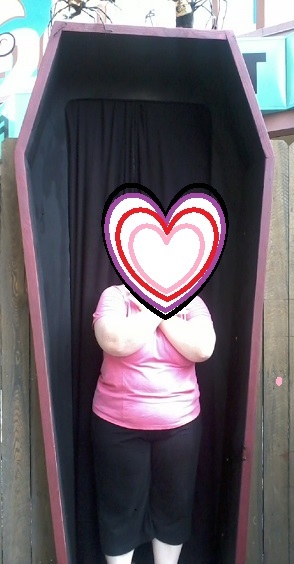 I did not like the thought of one of my kids in a casket, even for fun, so I tried to lighten the mood by putting hearts over her face! I don’t know how long this DEATH FASCINATION craze will last but I hope I live long enough to see it fade away. Nonetheless, I AM handicapped and don’t know if I’ll die young or live a long time; so I’ve left specific instructions to my children to have my body cremated. Of course, this has been my desire for the past 3 decades and all of my family has known this so it’s well thought out. The only person that would’ve contested it was Daddy but he’s already in heaven. Mama is ok with it and so are the kids and the four of them are currently considered my ‘next-of-kin‘; they all understand my reasonings. My final wishes oughta be respected because they are just that: MY FINAL WISHES! I won’t be asking anything more. Just don’t show my dead body please! I’m a happy and friendly person. I don’t know if I will continue to be so as my illness progresses but I wish to be remembered that way!